The Fingerboards Mine will produce concentrates of mineral sands. Mineral sands are the valuable part of the ore body and are zircon, titanium minerals and rare earth minerals. The concentrates will be mineral sand concentrate (otherwise known as Heavy Mineral Concentrate HMC), magnetic concentrate (mostly ilmenite a titanium mineral with some rare earths), or non-magnetic concentrate (containing zircon, high titanium minerals and rare earths). These concentrates will be further processed to final mineral products in China and SE Asia. The products sold after processing will include zircon, rutile, ilmenite and rare earth concentrates. There are numerous mineral processors in China and their capacity far exceeds the supply of mineral sand concentrates from existing mining operations around the world. As such, there has been strong interest from potential off-take partners for Kalbar’s concentrate products. Demand for zircon and titanium minerals (rutile and ilmenite) is largely driven by the construction industry, as about 50% of zircon is used in ceramics and over 70% of titanium minerals is used in paints and other surface coatings. Construction roughly tracks the growth in global GDP and hence demand for these products has increased by 3% per annum over the long term. 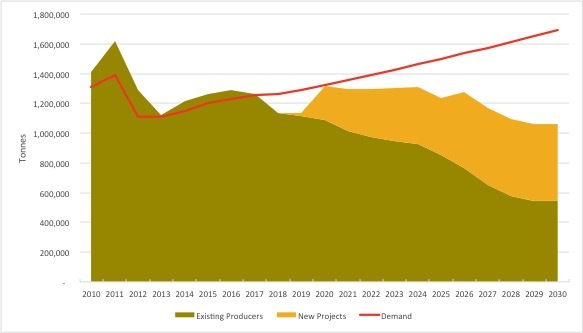 In contrast, supply of zircon peaked in 2011 and new zircon mining projects are needed to meet the looming gap between supply and demand in the coming years. Supply of high grade titanium minerals has also tightened over the last 12 months due to strong demand from the paint industry, but static production from existing mines. There are also a number of rutile producing mines which will close over the next few years, increasing the need for production from new projects. Kalbar uses it’s in-house market knowledge to model supply and demand for our commodities. The chart below shows our estimates of the current supply and demand dynamic for zircon. Note the significant supply shortfall in 2019. The zircon price has recently exceeded TZMI’s estimate of the incentive price, and this should see some new projects get off the ground. We estimate four new projects (including the Fingerboards) will enter production in 2020. However, the declining supply from existing operations means the deficit is likely to continue. Longer term it is clear that supply from unconventional projects is required. Rare Earths are used in a myriad of applications but are most significantly used today in the manufacture of permanent magnetic motors which are required for green technologies. Although alternative technologies exist, the growing demand for lighter, more powerful motors requiring less maintenance is increasing demand for the key rare earths in the Fingerboards deposit; Neodymium, Praesodymium and Dysprosium. Demand for all rare earth metals is expected to grow by over 5% per year in the medium term, while the rare earths used in magnets is forecast to grow by over 8% per year within the same time horizon. Such strong demand growth cannot be met by existing producers and new sources of rare earth minerals, such as those from the Fingerboards Mine will be needed to fill the supply gap. Projected growth in wind power. On average, every MW of wind capacity installed with a PM generator will create demand for 200kg of REO. Projected electric vehicle demand growth. On average each EV will create demand for 1 kg of REO. Projected demand growth in industrial robots. On average each industrial robot will create demand for 6 to 8 kg of REO.